In the late 1880s, when Charles Conder and Tom Roberts were developing their vernacular Impressionist art forms, Sydney’s light-filled beaches became crucial subjects in their work. The pair had met in Sydney in 1887 and by the following year were painting together at the headlands of Coogee Beach. Exploring sites around Sydney’s coastline, they seized on the sun-infused landscapes to further their exploration of local light and colour. Introducing the beach as a subject to Australian Impressionism, their paintings came to influence their friend Arthur Streeton who moved to Sydney from Melbourne in 1890 and developed, from his observations of his peers’ works, his own characteristic impressions of Sydney’s coast-bound landscapes. Conder’s exploration of the local conditions of light and colour on Sydney’s beaches resulted in some of the young painter’s most innovative experiments. In this context 'Bronte, Queen’s Birthday' is an exceptional work in the artist’s early oeuvre. Conder here invokes the crisp ambience of the beachscape on a Sydney winter’s day while at the same time composing the scene with an Aestheticised sense of colour harmony. 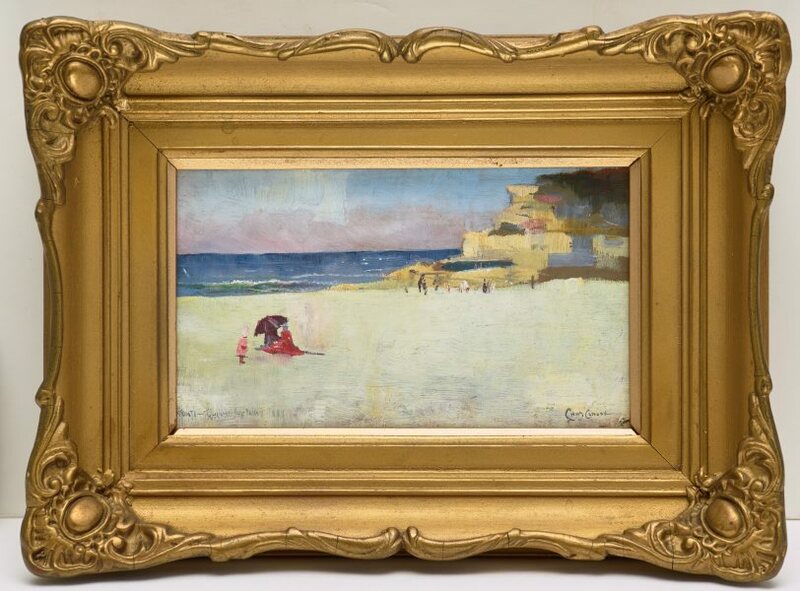 The hues of Conder’s signature red accents, repeated throughout works at this time via details of the dress or accoutrements of his figures, are here infused throughout the landscape in the pink tonalities of sky, cliffs and sand. Conder had noted the Whistlerian approach of colour harmony composition, but 'Bronte, Queen’s Birthday' reveals how he adapted these methods as his own. His works developed from his observations of nature, but he too harnessed the suggestive power of Aesthetic colour practice to produce landscapes of a dreamy distinction, envisioning a new poetry of place. Signed l.r. corner "Charles Conder". Not dated. 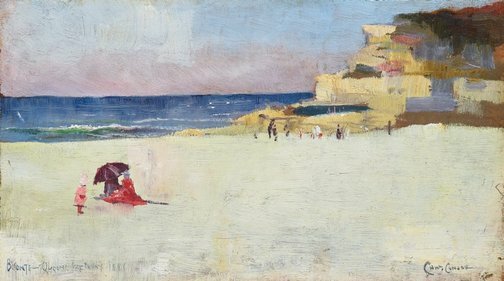 Charles Conder 1868-1909 , Sydney, 2003, 15, 75 (illus.). Art and Australia , Sydney, Jun 1967, 387 (illus.). Australian Impressionism , Melbourne, 2007, 110. Look , 'Charles Conder: Bronte, Queen's birthday, 1888', Sydney, Nov 2017-Dec 2017, 30, 31 (colour illus. ).